DEFERRARI+MODESTI is a multidisciplinary study that focuses its research on architecture and interiors, design and communication. Born in 2010 in Florence, founded by Lavinia Modesti and Javier Deferrari. They develop projects for important companies and institutions such as Ex.t, Mirage, Marca Corona, Piaggio Museum, Targetti, PALP. Collaborate with IED coordinating the three-year Degree Course in Interior and Furniture Design at IED Florence. The Xgone coating system, which they designed for Mirage, was selected in the Adi Design Index 2015 and a candidate for the XXIV Compasso d’Oro. 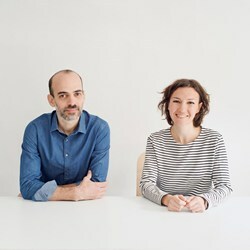 Their work has been published in numerous trade magazines including AD, Living, Elle Decor, Vogue House, Domus, Abitare, Interni, Hinge, Suite. The project of the cafe-bookshop Brac received the special mention of the “Bar and Restaurants d’Autore” award promoted by IN / ARCH with Archilovers, University of Roma Tre, Artribune and the patronage of ADI.